Who me? A bead hoarder??? Cough, cough, sputter. Um yah. I have a boatload of beads and many that I have hung onto for years. 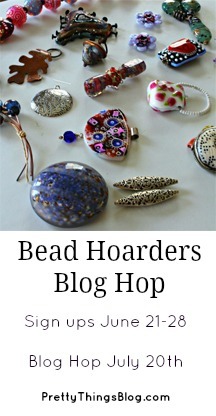 Lori Anderson could host a blog hop like this every month, and I’d still have hoarded beads to spare. So what’s this blog hop design challenge about? Well, I’ve noticed that I’m really, really good at collecting beads, but not so good at parting with them! I’ve amassed a scary number of beads that need to see the light of day. I have excuses — lots of excuses. This one is too special, this set cost a lot more than I usually spend, this set needs just the right accent beads. Enough excuses! It’s time to play! Here are some oldies but goodies I managed to put to use in the last month or so. I purchased the sweet ladybugs charms from Golem Studios well over a year ago. The charms are so cute, but whatever I paired them with just looked lame. So I never used them – ’till now! I think these simple glass rings give them a little extra pizzazz, without competing for attention with the charms. I got this rabbit pendant from Shaterra Clay Studio in March of 2012. The triangular, peach aventurine has been in my stash for probably 5 years! A rabbit in our yard finally inspired me to use these. I love the peach and brown together. This next and last, pair of earrings uses rustic patinated copper rounds from Miss Fickle Media that I bought over 2 years ago. I love them with my new spiky ceramic charms from Off Center Productions. Thanks for hosting this fun blog hop, Lori! I look forward to visiting others’ blogs! Here are all the participants. Click to find out what they have been hoarding and what lovelies they designed with their hoarded treasures. This entry was posted in Art Beads and Components, Bead And Jewelry Challenges and tagged artisan jewelry, bead hoarder, Bead Hoarders Blog Hop Reveal, bead stash, blog hop, earrings, handmade jewelry, Linda Landig Jewelry, Lori Anderson, necklace, Pretty Things blog. Bead blog by Linda Landig. Bookmark the permalink. 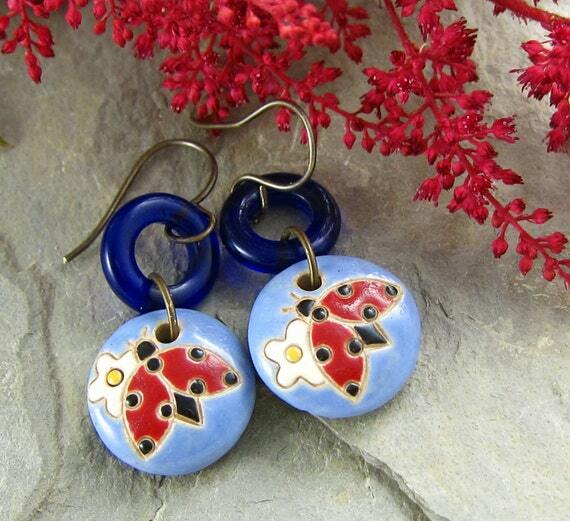 Oh the ladybug earrings are so sweet, love the glass ring with them, it works so well. Stunning pictures, the photography sets off your beautiful work a treat! I love what you made, and the blue rings with the ladybugs are perfect! Wasn’t it fun to use beads that you haven’t before? All of your designs are lovely but those earrings are really yummy! Gorgeous makes!! I too am a great bead hoarder… 😉 I am especially fond of the earrings in your last photo – what a marvelous pairing!! I love the bold and sassy earrings! Really great work! These are great! I love the last pair of earrings! What fun pieces – love your stash – & your pictures are gorgeous! I like all three of your pieces. Good job using your bead hoard. The ladybug earrings are my favorite. Wonderful creations – love the Big, Sassy Earrings! I always love seeing your jewelry. Just lovely!! I love the big bold sassy earrings. 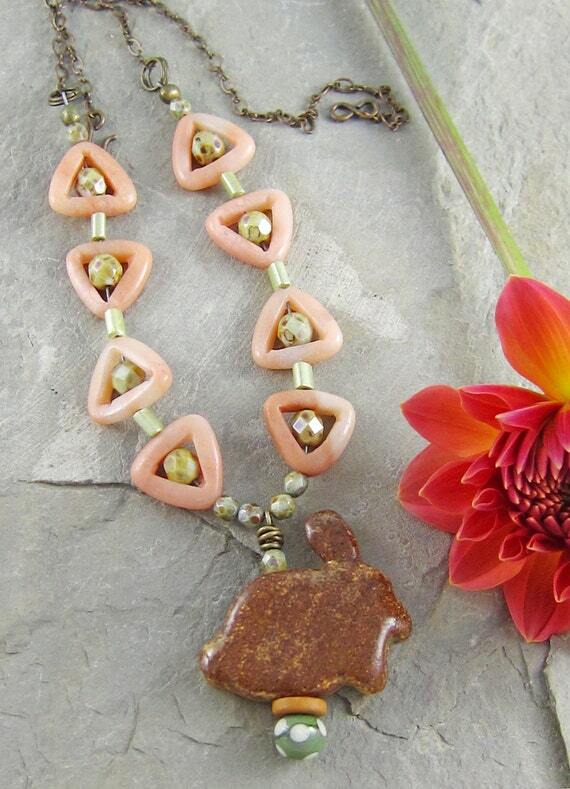 Love all your pieces, that rabbit is pretty darn cute! Love the Lady Bug earrings but they are all adorable. Oh, those little ladybugs are adorable ! The lady bugs are cute but the last earrings are my favorites. Love the colors! You must have had a great time, designing those beautiful earrings and the necklace! Those colours, wow! Oh I love your Rabbit necklace~its just has an unusual and different twist! It stands out..love it really nice! I love your makes! So bold and sassy. My fave is the cheeky rabbit necklace. it looks like you had a lot of fun making your pieces. The ladybug earrings are my favorite!! Sorry to be so late commenting, Linda (I always work from the end of the list when hops are THIS big). With your busy schedule it’s good you were able to include some beautiful designs from previous posts… always a joy to see your creations! 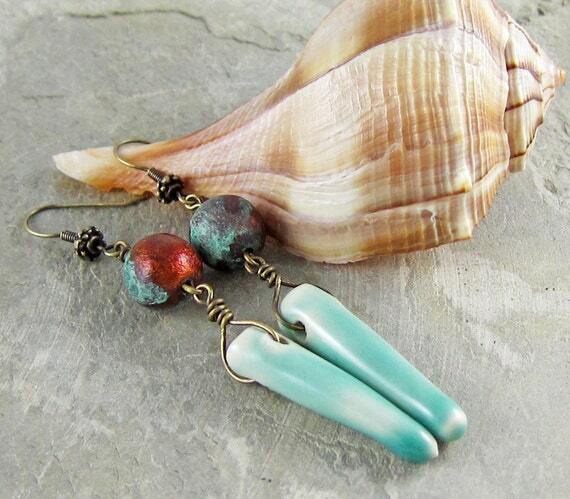 Love love the turquoise earrings, all your pieces are wonderful! As always, your pieces are gorgeous! I like the idea of the monthly hoarders’ hop, but my inner hoarder cringes at the thought. re: your comment on the idea of a monthly challenge made me laugh!! Don’t know how I missed you first time through the list, but glad I caught up. Admire all your pieces, but loving the bunny necklace. Those triangular beads are wonderful! I always love your designs and these are no exception! It’s also nice to know someone else has enough hoards to do this monthly for awhile…makes me feel less lonely in my bead masses…lol! Very nice! you created three very distinctive designs, and I’d have trouble choosing which I like best! I am still trying to hop around to all the blogs.